Today was a really relaxing day! I apologize for not having many pictures, but we had a day full of water activities so my phone was not with me all day. We started with a buffet breakfast at the hotel. It was sufficient and the kids enjoyed seeing some familiar things like pancakes, scrambled eggs and watermelon. 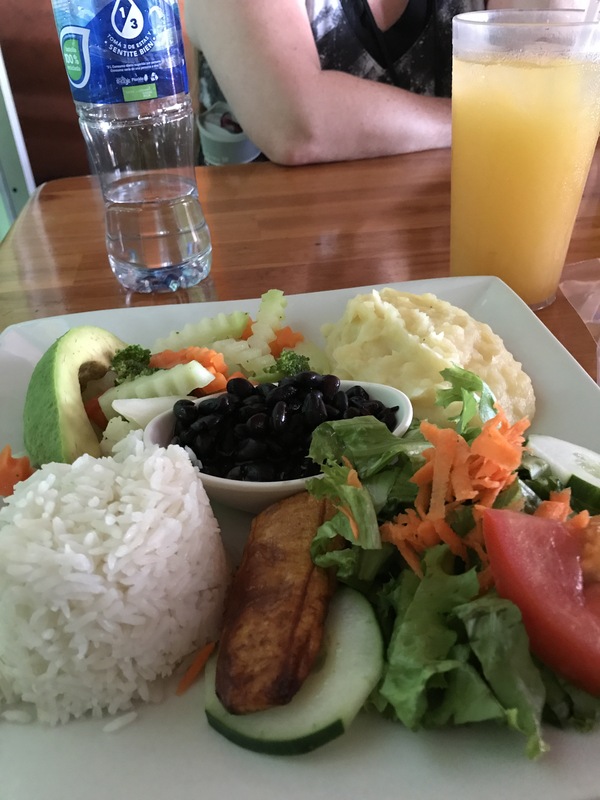 I enjoyed the local guayaba, papaya, gallo pinto and of course, the coffee. After breakfast, we started a 3 hour journey on the bus to the town of La Fortuna de San Carlos. This is the local town at the base of the Arenal Volcano. Until 2008, this volcano produced lava which drew in thousands of tourists to the region each year. Unfortunately, the volcano stopped erupting in 2008 and tourism has dropped significantly ever since. There are many shops and hotels along with various adventure activities in this part of Costa Rica. Today was a nice day with cloudy skies and a breeze. 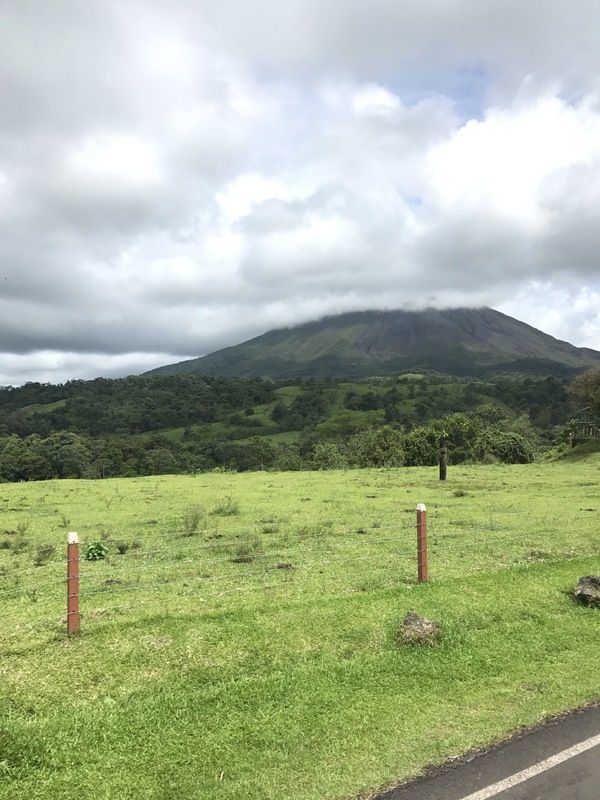 It was perfect for our hour long kayaking trip across Arenal Lake. I made a quick stop to a convenience store to pick up some sunscreen spray. When the price came up as $15,000, I didn’t flinch because my mind did a quick conversion to US dollars and realized that was about $7.50. It wasn’t until later that I realized my conversion was totally off! I had actually paid around $26 for my sunscreen! Darn it! Just when I start to think of myself as a sophisticated traveler, I do something careless like that! I’m far to proud to use my phone to convert in front of a cashier. I like to always appear to know what I’m doing. Well, that didn’t work too well for me today! I will NOT be sharing my fancy sunscreen with anyone! lol! After kayaking, we went to Baldi Hot Springs to enjoy the unbelievably warm and relaxing pools. The kids spent most of their time on the water slides while the adults ventured from pool to pool searching for the most relaxing place to sit still for a while! Around 6pm, we arrived at our hotel, the Arenal Palace Hotel. Our accommodations are basic. We won’t really be able to see the hotel until the sun rises tomorrow morning. It gets dark here before 6pm so it was rather wet and dark when we arrived. Online reviews state that the views of the volcano from the hotel are wonderful. I can only hope! 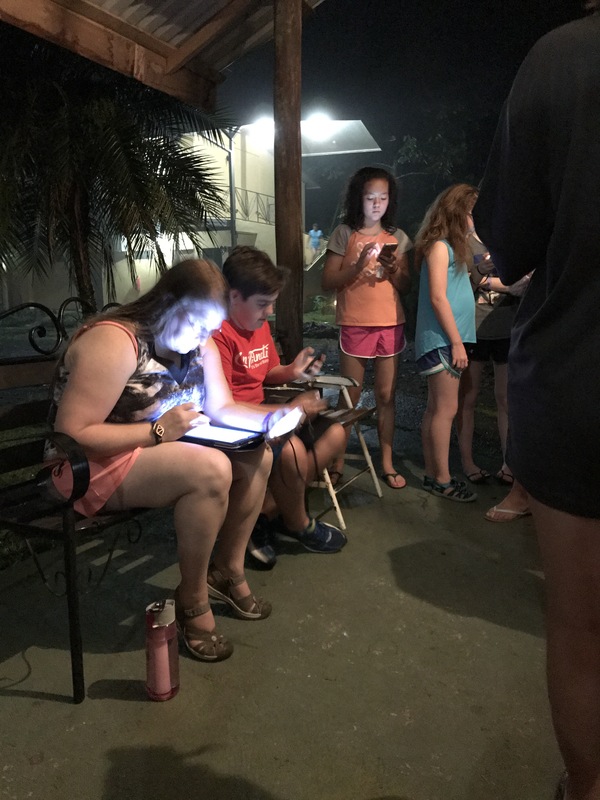 After a quick spaghetti dinner and some much needed Wifi time, most of the kids headed back to their rooms for the night. 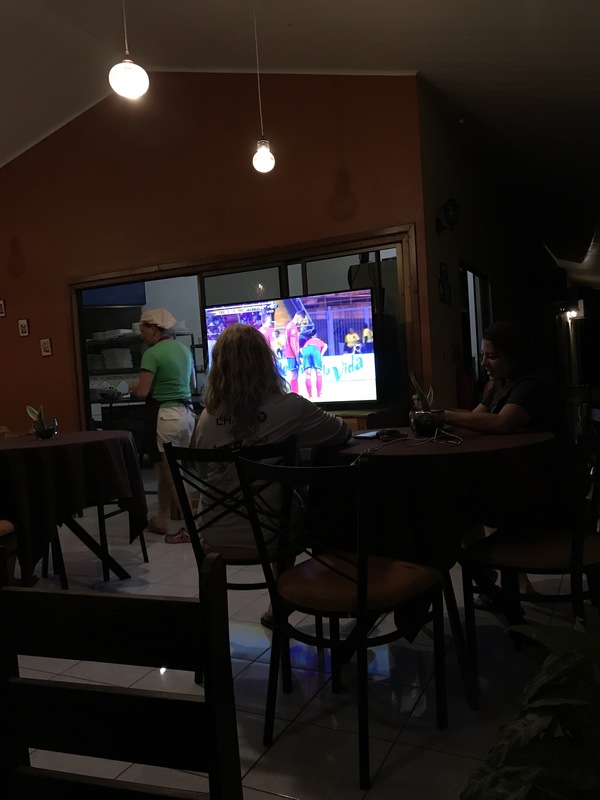 Some of the kids stayed in the dining area to watch the Costa Rican soccer game with the hotel owner and his family. Tomorrow, we will do waterfall repelling followed by a long hike through a series of hanging bridges. It should be a lot of fun! Thanks for continuing to keep us posted. Sounds like yesterday was a great day and today’s events should be exciting. Rappelling, hanging bridges, hot springs…WOW!